Naser Musa is recognized by critics of middle eastern music as a talented singer, a gifted songwriter, an Oud virtuoso, a valued composer, and a versatile studio musician. 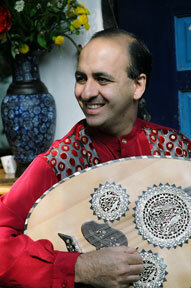 Naser Musa has composed, arranged, and recorded numerous projects in the Middle East and in the United States. His recording, among others, include "Khaliji” (RT Productions): a collection of folk songs from the Arabian Gulf region, and "Christmas and Beyond "(SahaRaneen Productions): a collection of Western Christmas carols and Arabic church hymns. Naser Musa’s name appears on dozens of albums, including contributions on projects for Hollywood with John Debney and John Cameron among others. He has recorded with pop stars Shakira, Beyonce and Michael Sembello. Naser Musa has shared the stage with Lebanese vocalists, Sabah and Ragheb Alame, and Egyptian vocalists, Hani Shaker and Hakim. Naser’s Oud was heard on the soundtrack of the film "The Passion of the Christ" by director Mel Gibson. An active and sought after performer, Naser has performed at prestigious venues such as Carnegie Hall, the Kennedy Center, Hollywood Bowl, the United Nations and Chicago’s Symphony Hall. He toured the United States, South America and the Middle East, and he regularly performs with prominent ethnomusicologists Dr. A. J. Racy of the University of California, Los Angeles (UCLA), and Dr. Scott Marcus of the University of California, Santa Barbara (UCSB). Mr. Musa was recently featured as a soloist with the Cairo Orchestra during its 2005 U.S. tour with Grammy award winners Youssou N’Dour, of Senegal and Egyptian producer and arranger Fathy Salama. The Washington Post described his compositions as “stirring”; the Beirut Times described him as one of the most versatile vocalists and Oud masters of the Middle East; and the Al Qabas newspaper of Kuwait described him as a talented songwriter with a soothing voice that touches the heart. A Jordanian of Palestinian decent, Naser Musa started playing Oud, a Middle Eastern lute, and studying Arabic music, at an early age while living in Amman, Jordan. He moved to the United States in 1982 and continued his studies of music at California Polytechnic University, Pomona, CA. His artistic versatility and sense of musical adventure have enabled him to experiment with the blending of different musical elements and artistic styles. Throughout his career, his objective has been to combine Arabic maqams: melodic structures or series of phrases based on Arabic scales, with Western elements in order to present a style of Arabic music that is understood and appreciated by the Western listener. Naser Musa is in great demand as an Oud and vocal instructor, giving lectures at colleges and universities and organizing workshops. He has been on the faculty at the Middle Eastern Music and Dance Camp in Mendocino, California since 1999 and at the Heartland Seminar of Arabic Music in Racine, Milwaukee since 2004. He also represented the Arab world in the World Culture Open in 2004, in New York, NY. Naser continues his work as a peace activist by performing and promoting concerts and presentations with artists from all over the world, He performed his award winning song Salam at the United Nations ‘60th year celebration in 2004. "Music is the sole border that we may all cross together with the passport of love in our hearts and peace in our souls."